Cicimurri, D. J., D. C. Parris and M. J. Everhart. 2008. 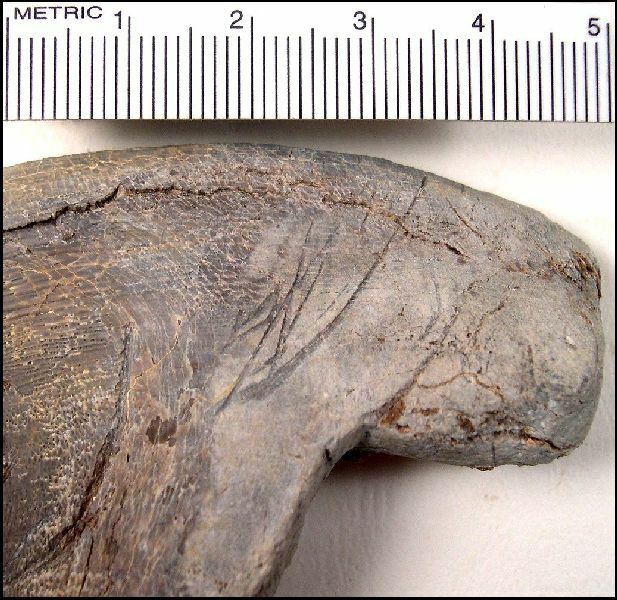 Partial dentition of a chimaeroid fish (Chondrichthyes, Holocephali) from the Upper Cretaceous Niobrara Chalk of Kansas, USA. 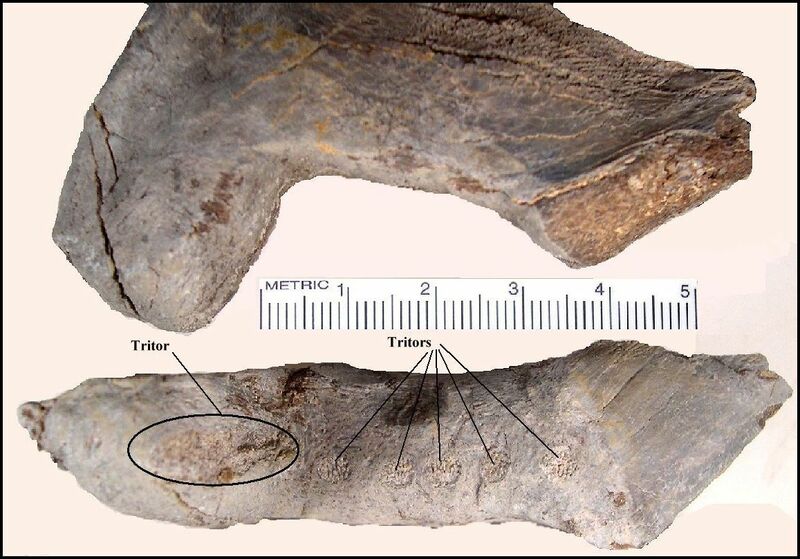 Journal of Vertebrate Paleontology 28(1):3440. The remains of FHSM VP-16685 were recently collected from the Smoky Hill Chalk and were identified first by Ken Carpenter (Denver Museum of Nature and Science) in August, 2006. 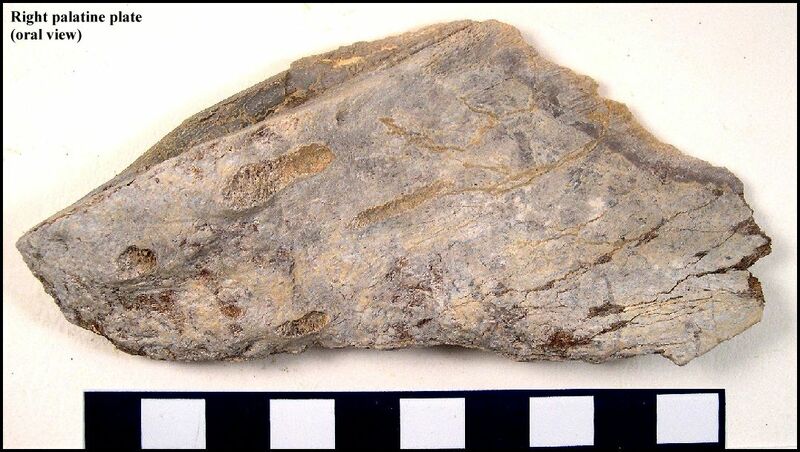 They were also independently identified a couple of days later by David Parris (New Jersey Museum of Natural History) and David Cicimurri (Bob Campbell Geology Museum, Clemson University). Based on a comparison with the type specimen of Edaphodon laqueatus (Leidy 1873 - see below) in the Academy of Natural Sciences of Philadelphia, we now believe the two individuals are closely related. 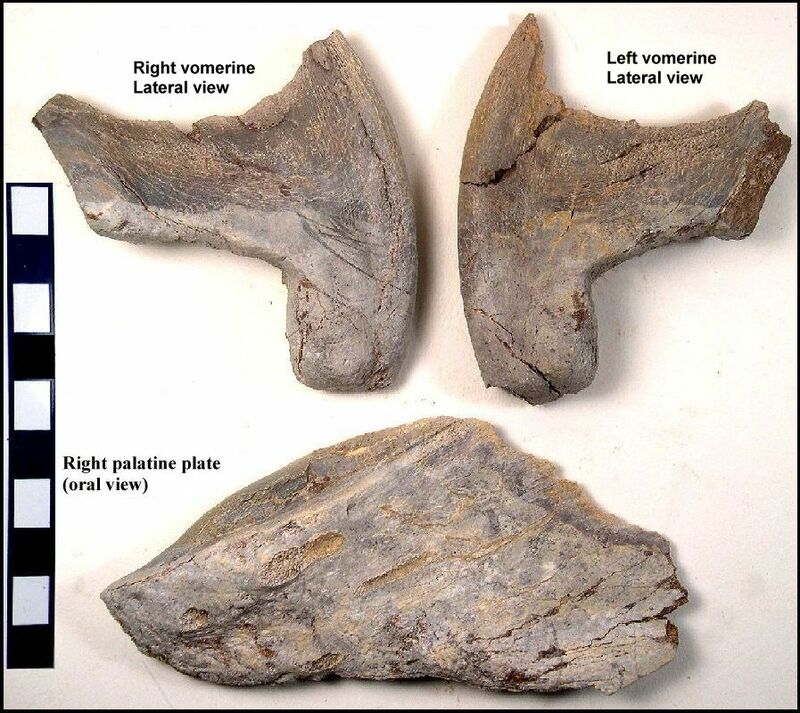 LEFT: FHSM VP-16685 is only the second known remains of a ratfish (chimaeroid) from the Smoky Hill Chalk. 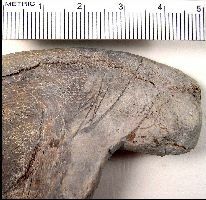 The first, a large, dorsal fin spine (BMNH P 10343), was collected by English immigrant H.T. Martin along Hackberry Creek in Gove County about 1900, and was acquired by the British Museum of Natural History (see also Stahl, 1999, fig. 143). The fin spine is approximately 45 cm (18 in) long. This specimen was collected within ten miles of the FHSM VP-16685 material and at approximately the same horizon. (Photo credit: British Museum of Natural History, London). Note that Handel Tong (H.T.) Martin worked for many years as a collector for the University of Kansas Museum of Natural History and was the preparator of the type specimen of Dolichorhynchops osborni (KUVP 1300). 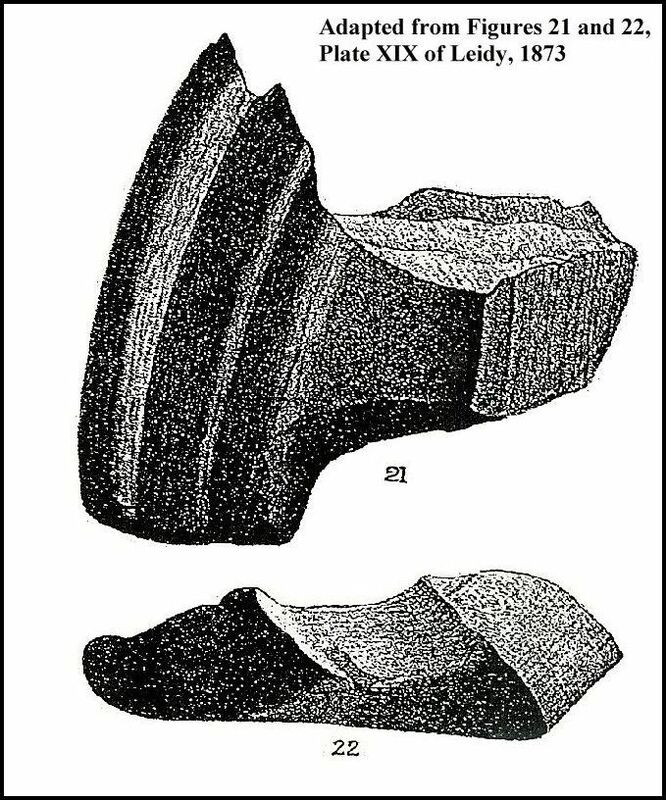 LEFT: KUVP 1136 - Ichthypriapis hubbsi; A chimaeroid clasper described by Hibbard in 1942 (Figs. 1-4). 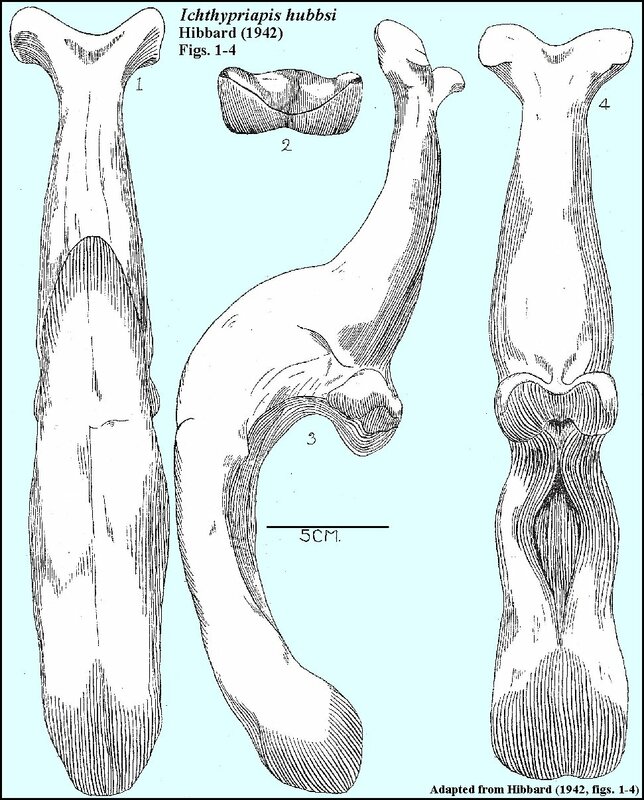 The specimen was collected by G.F. Sternberg in Logan County about 1912. 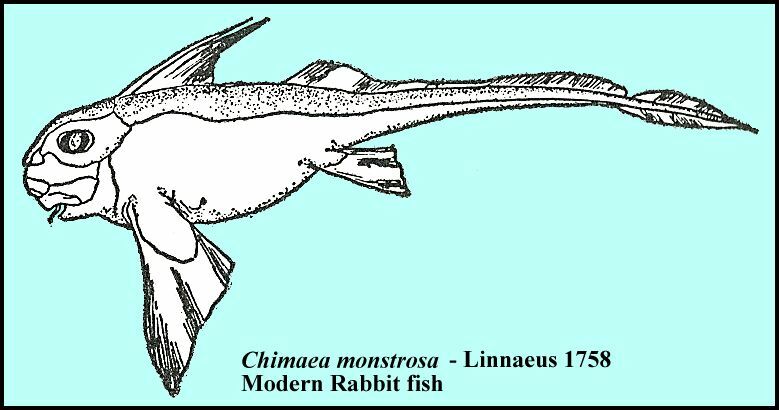 It had been associated with a specimen of Protosphyraena gladius (KUVP 465), but remained unidentified until Hibbard decided it was probably part of a chimaeroid. Adapted from a photo by Matt Friedman. Fig. 21, 22. Eumylodus laqueatus: Mandible [vomerine] two-thirds natural size. From the Cretaceous formation of Mississippi, discovered by William Spillman. LEFT: Top - Close up of the left vomerine in lateral view. Note that only 4 small, circular tritors were found on the left vomerine (five on the right). 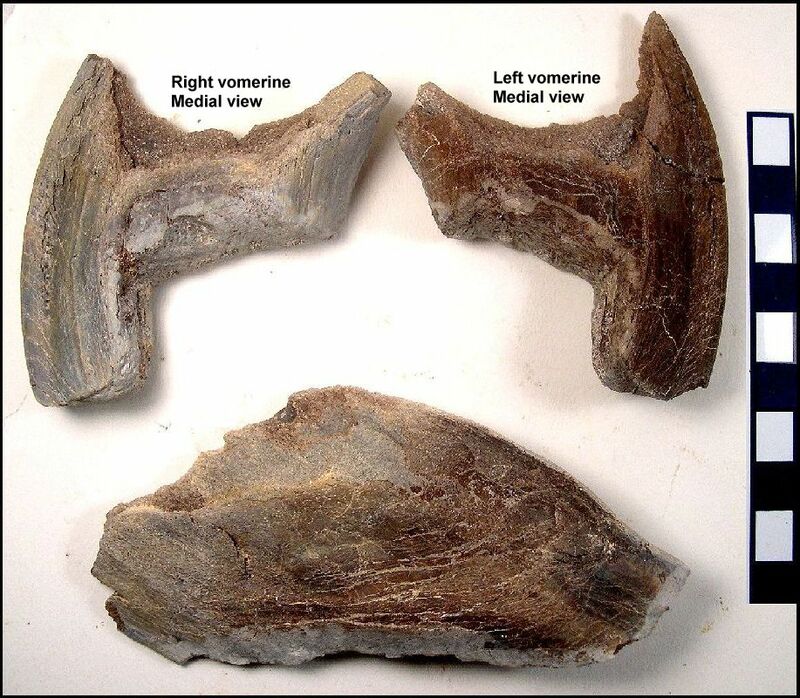 Bottom: A close-up of the right vomerine of FHSM VP-16685 showing five circular patches where the tritors were originally attached to this tooth plate. The oval outline indicates the larger and anteriormost tritor on the beak of the vomerine. Credits: Copy of figures from Leidy 1873 provided by Earl Manning. Duffin, C.J. 1996. Holocephalans in the Staatliches Museum für Naturkunde in Stuttgart: 4. The earliest German chimeroid. Stuttgarter Beitr. Naturk. Ser. B., Nr. 240, 10 pp., 4 fig. Duffin, C.J. 2001. A chimaerid (Holocephali, Chimaeriformes) vomerine toothplate from the Upper Cretaceous of Belgium. Palaeontology, 44(6)1179-1188. Hibbard, C.W. 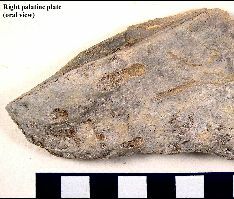 1942 A new chimaeroid fish from the Niobrara Cretaceous of Logan County, Kansas. University Kansas Science Bulletin 28-2(11):237-240, 4 fig. Hoganson, J.W. and Erickson, J.M. 2005. 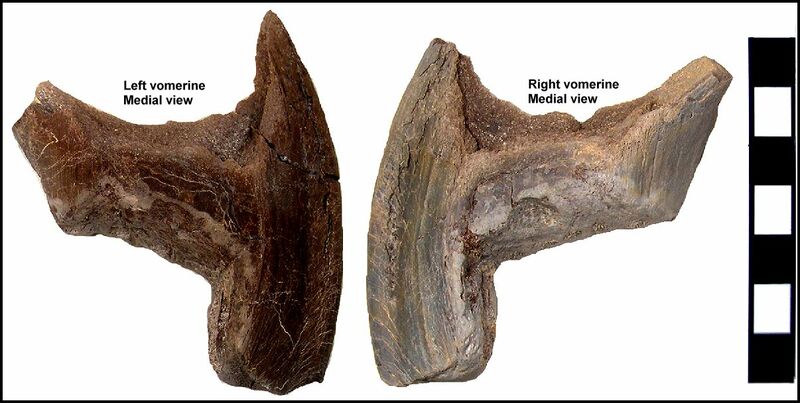 A new species of Ischyodus (Chondrichthyes: Holocephali: Callorhynchidae) from Upper Maastrichtian shallow marine facies of the Fox Hills and Hell Creek formations, Williston Basin, North Dakota, USA. Palaeontology 48(4), 709-721. Hussakof, L. 1912. The Cretaceous chimaeroids of North America. Bulletin of the American Museum of Natural History 31: 195-228. Leidy, J. 1873. Contributions to the extinct vertebrate fauna of the western interior territories. Rept., U.S. Geological Survey Territories (Hayden) 1:358 pp., 37 pls. Manning, E. M. 1994. Dr. William Spillman (1806-1886), pioneer paleontologist of Mississippi. Mississippi Geology. 15(4):64-69. Parmley, D. and Cicimurri, D.J. 2005. 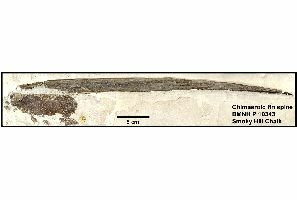 First record of a chimaeroid fish from the Eocene of the southeastern United States. 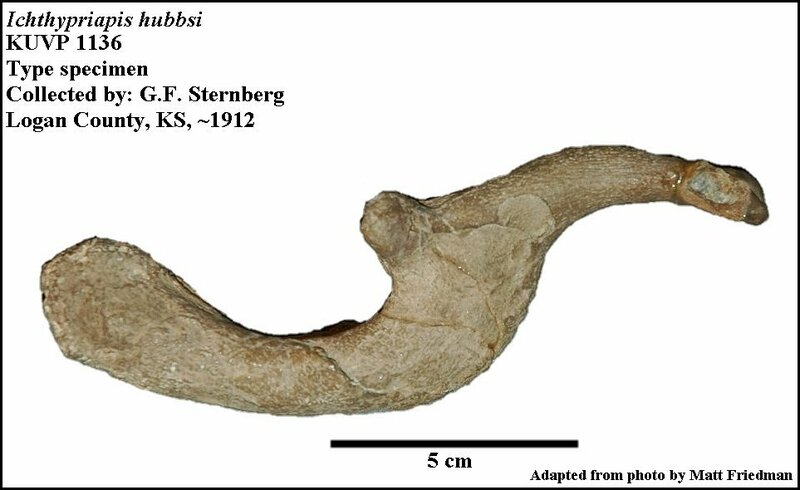 Journal of Paleontology 79(6): 1219-1221. Stahl, B.J. 1999. 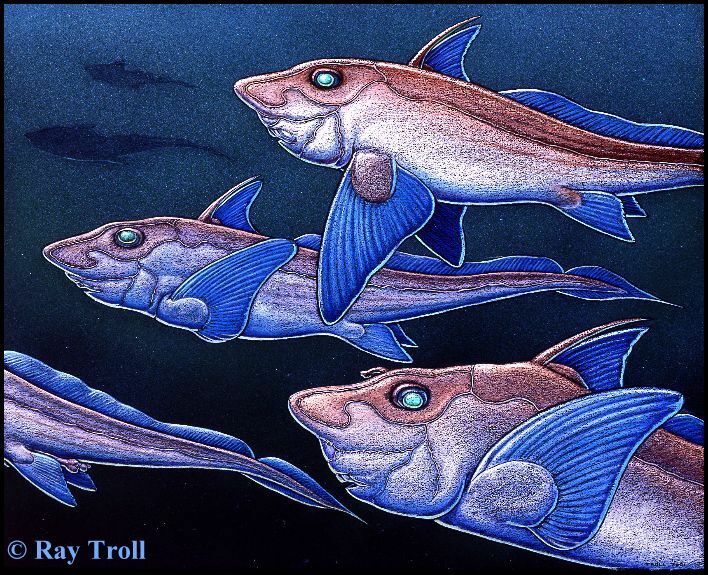 Chondrichthyes III. Holocephali. Handbook of Paleoichthyology 4. Verlag Dr. Friedrich Pfeil, Munich. 164 p.
Stahl, B.J. and Parris, D.C. 2004. The complete dentition of Edaphodon mirificus (Chondrichthyes: Holocephali) from a single individual. Journal of Paleontology 78(2), 388-392.